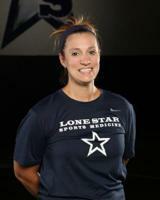 Coach Beaty is in her 4th year at Lone Star High School, 11th year in FISD and 12 years teaching overall. Tysha was born and raised right here in Frisco, Texas where she was a student athlete and student athletic trainer. Her love of sports and helping others regain their athletic ability led her to Texas Tech University. Coach Beaty was accepted into the Student Athletic Training Program at TTU which helped her obtain her degree in Exercise and Sports Science. After completing her undergraduate work at TTU, Tysha stayed a 4th year to complete her teacher certifications and also complete her last year in the TTU Sports Medicine program. Once she completed her teacher certification classes, Tysha came back to her alma mater and began her Athletic Training/Teaching career at Frisco High School. After 2 years of being at FHS, Tysha joined the Wakeland family and this is where she would ultimately start her family. After working at WHS for 5 years, her husband joined the US Army and moved to Fort Hood for 1 year. She joined the Ranger Nation for the 2013-2014 school year as a split campus Health Science Teacher. Coach Beaty and Coach Clark made a position change in Jan. 2017. Coach Beaty is excited for this new chapter in her and her family’s life. Coach Beaty is a member of the National Athletic Trainers Association, the Southwest Athletic Trainers Association and the Texas State Athletic Trainers Association. She is married to her husband Colin and have a daughter Benning (4) and son Fenway (2). Coach Beaty loves to spend time with her family, be outside, and travel. 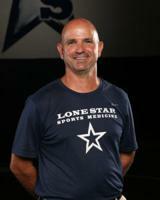 Dr. Sean Haslam is starting his 3rd year as provider of our team physician services for all athletes at LSHS. Dr. Haslam will be making weekly trips to Lone Star to evaluate injuries to our athletes that are the result of an injury incurred while participating in athletics for Lone Star HS. Appointments to be seen by Dr. Haslam can be made by contacting Coach Martinez or Coach Clark. Dr. Haslam is located in the Baylor Scott and White Centennial Medical Center Pavilion 1. Dr. Haslam received his BS degree in Zoology from the University of Calgary in Alberta, Canada. He also completed medical school there. He did his Residency in Orthopedic Surgery at Queens University in Kingston, Ontario. Dr. Haslam completed his ACGME Fellowship (Associated Orthopedic Sports Medicine, Reconstructive and Arthroscopy Program) in Plano, Texas and a Hip and Knee Arthroplasty Fellowship in Calgary, Alberta. Dr. Arora, or as we call him Dr. A, has provided our chiropractic needs for years now. Dr. Arora received his Bachelor of Science degree from the University of Toronto in 1997. In 2005 he earned his Doctor of Chiropractic degree from Northwestern Health Sciences University in Minneapolis, Minnesota. As he was wrapping up his studies in Minneapolis, he moved to Dallas to complete an externship an instantly fell in love with the DFW community and decided to settle here. Dr. Arora initially practiced Chiropractic in Grand Prairie, Texas. in 2007 he started a family practice in McKinney, Texas. He recently opened Arora family Chiropractic here in Frisco in June 2010. It was apparent that the Frisco community was family oriented and growing rapidly, a perfect environment for his growing practice. Dr. Arora, or many of his patients like to call him, Dr. A, enjoys spending his free time with his family and traveling to Toronto, where he grew up. He is also a member of the Frisco Chamber of Commerce.